Korix places you somewhere deep in space, fighting for your race’s survival after your home world is destroyed. With nothing left to lose, you are put in the role of commander with the sole mission of taking the fight back to the enemy, showing them that you will not go down without a fight! 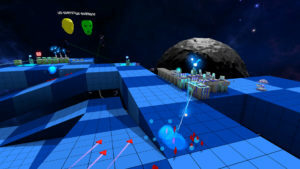 Built from the ground up for VR, Korix is retro-styled real-time strategy crossed with tower defence elements to provide old-school gameplay reminiscent of RTS games from the late ’90s. The game is played out in miniature right in front of the player and features a three to five-hour campaign, skirmish modes and online multiplayer (two to four players co-op or vs). 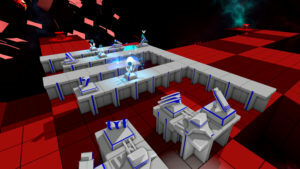 Running at a native 120fps, Korix is a silky-smooth experience and by using tracked controllers players can reach into the environment and take full control. Or as we discovered with initial multiplayer testing, start chasing each-other around, trying to put each other off. We had a lot of fun creating Korix and hope to see you (literally) in the game! Is Korix suitable for people who suffer from simulator sickness? Yes! Korix is generally a stationary game, where everything happens in front of you. You can rotate the level, but by default this is a snap-turn and does not cause any discomfort. If you do not suffer from simulator sickness then you can enable the “Smooth rotate” feature in the options menu for more control. What internet connection is required for online play? To join a game any good broadband connection will suffice. Korix only requires internet speeds of around 128Kbps upload and 512Kbps download to join a multiplayer game. To host a game you will need a minimum upload speed of 512Kbps to be able to host. Unfortunately high latency links, like satellite links, are not suitable for playing Korix. How do I change may players colour in multiplayer games? Simply click the T button (move) or X button (DS4) while pointing the lazer at your avatar while in the lobby. How do I select a different target in VS mode? Simply put the controller in select mode by pressing O (clearing anything on it), point at the turret/wall/base you want to attack and press the T button on the move controller, or the X button on the DS4 controller. Is the PlayStation Move Controller required? Not at all. However, it is heavily recommended as its easier to place turrets at strange angles with the move controller. LOTS. But half the fun is working out your own play style. Saying that… If a few minutes into a level you don’t have a good number of workers, you are doing it wrong! Also, don’t forget, holding X on the move controller (trigger on DS4) will also tell all turrets in range to attack the base! Every time you win a “VS” match you will gain League Points, 10 for every person you beat . If you loose, you will loose 5 points. Your league points never go below zero and they are tracked on the global leader board. Can you get to number 1? Note: Your rank is displayed at the end of every “VS” match and also you can see peoples rank on the end of their Online ID when they host a game (so you know what you are getting into). How do I set up a private game? Before you select “start hosting” check the “Pin Protect” tick-box in the bottom right and enter a pin-code. Only those who know the pin-code can join your game! 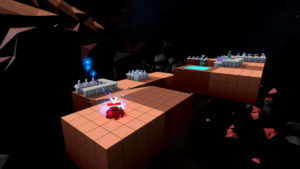 Have some great ideas for your own Korix levels? Well why not send you ideas in to us? Each time I work on a Korix patch I will sort through all level ideas sent in, pick the best and add a few of them (time permitting). If one of your levels are chosen, I will credit you in both the credits screen and on the level itself! Simply download the pack below, which has full instructions on how to design and send in your level ideas. 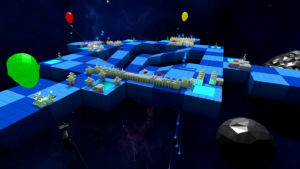 Note that by submitting a level design you grant StellarVR perpetual, unrestricted, unlimited rights to use the level design in Korix. Hello, my name is Mark Taylor, founder of StellarVR and I am the lead developer for Korix. 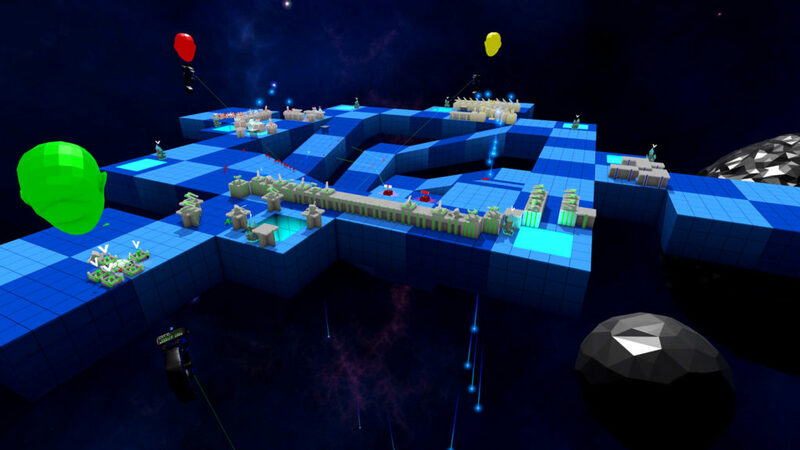 Korix was born when I was stuck on a delayed flight and playing a simple but addictive mobile strategy game and thought to myself “there really should be more of these games on console”. I had been teaching myself game development for a few years as a hobby, so I knocked together a prototype and soon realised that it would really work well in virtual reality. Korix was born. With some help from Sony I handed-in my notice (I was working in IT) and Korix has become my primary focus and passion since then.